Can Nandan turn Air India around? Small steps: Nandan expects a reworked winter flight schedule to lead to a saving of at least Rs 220 crore. Mumbai: Air India’s chiefs all have a singular ambition when they take charge—turn the carrier into a viable business. “I certainly don’t have a magic wand...but I am doing all basic things to attain operational efficiency and financial freedom," Nandan, 54, said in an interview. “I have met at least 200 employees in the last few weeks and they are fairly positive about the airline." The Indian Administrative Service officer is reworking the winter schedule, reconfiguring aircraft, outsourcing non-core functions and meeting employees every week to boost morale. Predecessor Arvind Jadhav, too, sought to achieve this through meetings and a series of letters explaining his vision for the airline that has at least ₹ 22,000 crore in accumulated losses. But he had to leave after alienating both employees and the government. The government’s propensity to put bureaucrats in charge of the airline adds to the scepticism in some quarters. “You need a qualified turnaround specialist to revive Air India," said Hormuz P. Mama, an independent aerospace analyst. “You need rigorous cost-cutting measures to save Air India. With this bloated workforce (30,000 workers), it is difficult to turn around Air India." Cutting expenses may not be enough. “Even if the airline were to succeed in lowering its costs, it would not be enough because its unit revenue is not likely to increase, given the uncompetitive brand and products," said Nawal Taneja, professor emeritus at the department of aviation in Ohio State University. “Think about the fact that the Star Alliance members chose not to accept it in the alliance. That pretty much tells the story." Star Alliance recently suspended Air India’s entry, saying that the airline had not met some conditions. Nandan is retiring old planes, swapping high-cost loans with cheaper ones, setting up cells to monitor plane schedules, enhancing ancillary revenue by insisting on excess baggage charges and negotiating hard with food and information technology vendors for lower rates. Air India has also returned 22 leased planes and grounded 25 old ones to cut fuel consumption. It is also exploring ways for efficient use of commercial space in its headquarters at Nariman Point, the Mumbai business district. 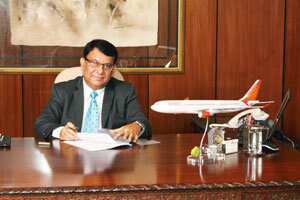 “Air India needs to focus on fundamental issues of discipline, productivity and financial restructuring," said Narayan K. Seshadri, chairman and chief executive officer, Halcyon Resources and Management Pvt. Ltd. “The growth is there as one could see carriers like IndiGo and SpiceJet are growing in double digits." Seshadri is known for turning around private companies. Jadhav’s tenure saw an ambitious bid to rope in operational expertise from overseas and the private sector. But none of the four hired from the private sector in key positions lasted long. Nandan doesn’t have any dramatic solutions in mind as of now. His plan is to stick with the basics while awaiting the 27 October group of ministers meeting that is expected to decide on the carrier’s latest turnaround plan, including equity infusion, financial restructuring and an order for 27 of Boeing Co.’s 787 Dreamliner planes. Nandan expects the winter flight schedule to lead to a saving of at least ₹ 220 crore as the airline reworks the frequency and timing of flights as well as routes. “If we can’t make profit, we want to cut down losses. We have set up another committee to find out the possibilities of reconfiguring planes that will yield better returns and cut costs," Nandan said. Rival carriers Jet Airways (India) Ltd and Kingfisher Airlines Ltd have similar plans. The objective is to reduce the interest burden and increase operational efficiencies across the network. Apart from an open house every Wednesday at which employees are encouraged to express their views, the chairman plans to resume paying productivity-linked incentives, or PLIs, something Air India was forced to stop in July. PLIs can account for as much as 30-50% of the money that employees get. Air India executives say efforts by Nandan (and Jadhav before him) have started showing results, citing a decline in operational losses to ₹ 266 crore in August from ₹ 507 crore in April. The carrier has also managed to pay the July instalment of bank dues. It will need to make the next payment by October to avoid turning into a defaulter. A loan turns bad if a borrower cannot service it for three months, another reason why the meeting of the group of ministers later this month is critical for the airline’s survival. Out of the ₹ 5,000 crore bailout by the government currently under way, Air India got ₹ 800 crore in 2009-10, ₹ 1,200 crore in 2010-11 and an ad hoc equity infusion of ₹ 710 crore in the current fiscal. The cabinet committee on economic affairs has approved another equity infusion of ₹ 1,200 crore. Besides the current bailout plan, about three months ago, Air India had sought an immediate equity infusion of ₹ 6,600 crore and a total of ₹ 42,920 crore financing support by 2021, including guarantees and soft loans among others. The airline expects to save ₹ 1,000 crore in interest costs if the financial restructuring plan is approved. So far, Air India has refinanced a high-cost $1.15 billion loan from IDBI Bank Ltd with a new loan from ICICI Bank Ltd, and a $475 million loan from Standard Chartered Plc with a Citibank NA loan, saving about ₹ 300 crore annually. Another executive said passenger revenue for Air India was up 4% to ₹ 5,000 crore in April-August 2011. It has targeted ₹ 1,200 crore additional passenger revenue in the current fiscal and ₹ 1,000 crore additional cargo revenue. Air India’s passenger revenue stood at ₹ 11,000 crore in fiscal 2011 and cargo revenue at ₹ 900 crore. “Air India is off to a good start in improving operational performance," said Srisu Subrahmanyam, co-founder, Orchard Group Llc, a Chicago-based consulting firm that specializes in execution and business improvement. “Aligning incentives with operational performance is a good way of ensuring that the employees are interested in customer-friendly initiatives," said Subrahmanyam, who used to work with United Air Lines Inc. “It has been used effectively in the US, where similar strained employee-management relationships exist. Improving customer experience and service is a necessary prerequisite, but Air India is a long way from winning back customers and still further away from survival." Nandan is aware of this, which is why he has chosen customer experience as the first issue to address. “The new chairman is closely monitoring the on-time performance of the carrier both for domestic and international flights. The next major thrust for him is cost control and revenue enhancement measures," said the second executive cited in the story. Jadhav did manage to lower the airline’s losss to ₹ 5,552.44 crore in fiscal 2011 from ₹ 6,994 crore in the year before. The trend is unlikely to persist with a pilot’s strike early this year shaving at least ₹ 200 crore off revenue.